You know those darling room makeovers that use fabulous old barn doors as part of the decor? 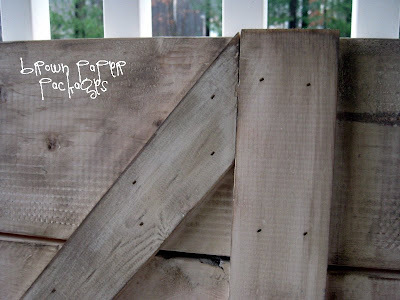 I have been on the hunt FOREVER to find one, and despite living in the midst of barn country, I’ve had no luck. 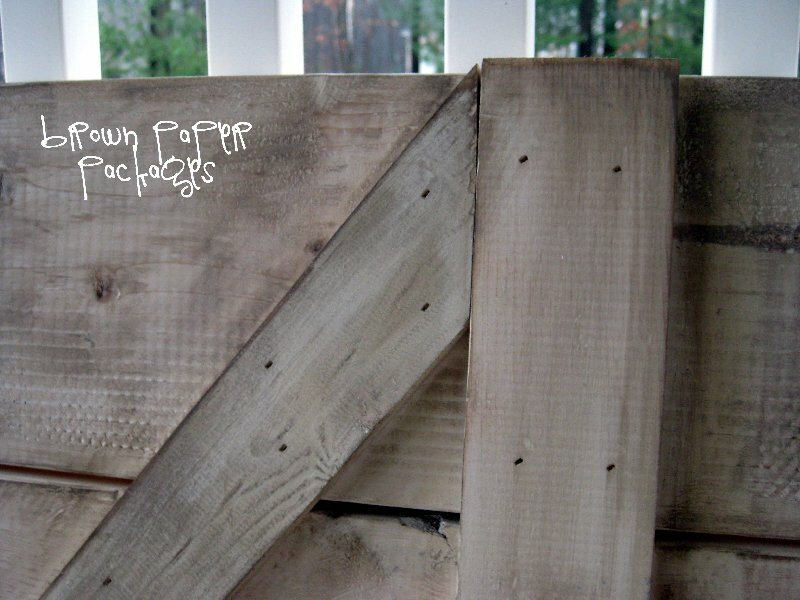 So, I decided to make one out of old wood, except that I was having a hard time finding that too. Well, a very smart friend of mine made one for her laundry room out of new wood, and I decided to follow her lead. My waiting was over! 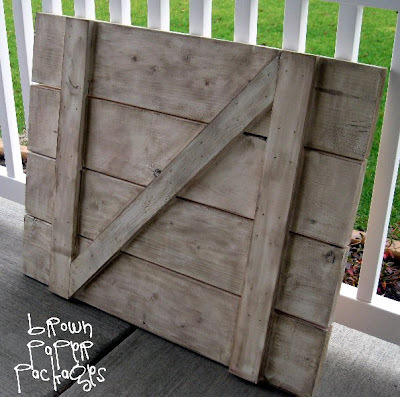 So, if you’re lucky enough to have some old wood laying around, this is the perfect project for it, or you can head down to Home Depot like me! You will not believe how fast and easy this is! I made 2 of them–one regular-sized red one, and a square cream one for my laundry room. LOVE them! 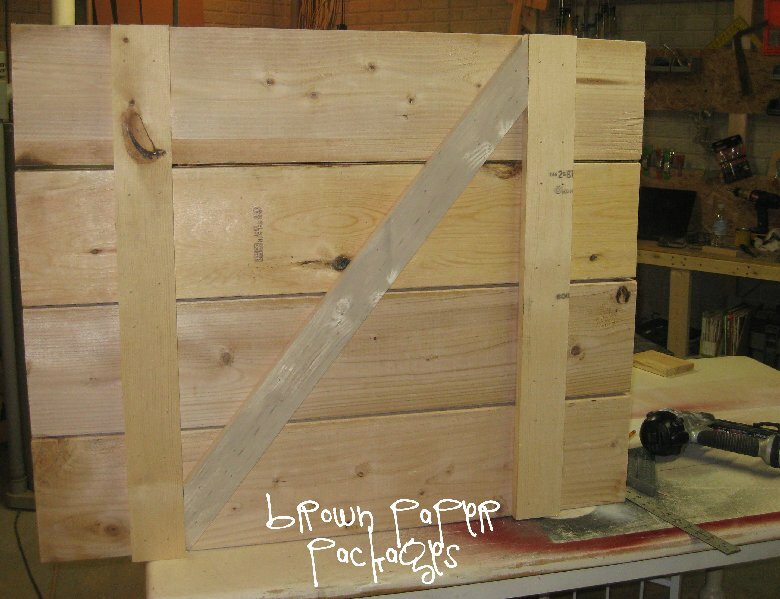 You can make them any size, and use any thickness of wood you like. I wanted it to be chunky, so I used 2 inch thick wood. 1. 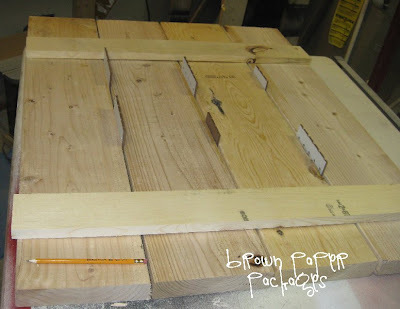 Cut (or have the hardware store cut them for you) your 2×8 boards into the desired length. My red door is 5 feet, and the cream one is 3 feet. 2. 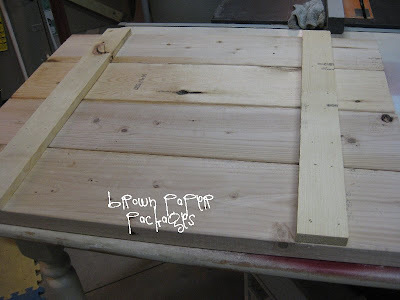 Lay them out on a smooth, flat surface–one that you can use a nail gun or hammer on. 3. You will be using the 3/4 inch x 4 inch wood as your braces. You need two pieces, on for each side. 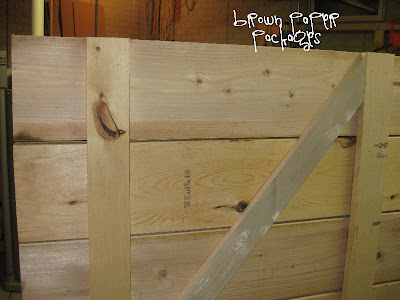 Cut them to match the height of the barn door. To keep the pieces evenly separated, insert spacers (we used pieces of cardboard) between each board. 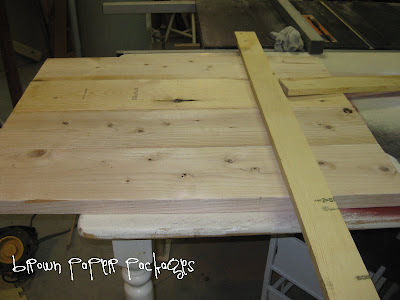 Measure in on each side how far you want the braces to be, and then using a nail gun (a hammer & nails will work, too!) and 2 inch nails, nail your braces to the 2x8s..
4. The last piece of wood is the cross beam, made from the 3/4 inch x 4 inch wood. 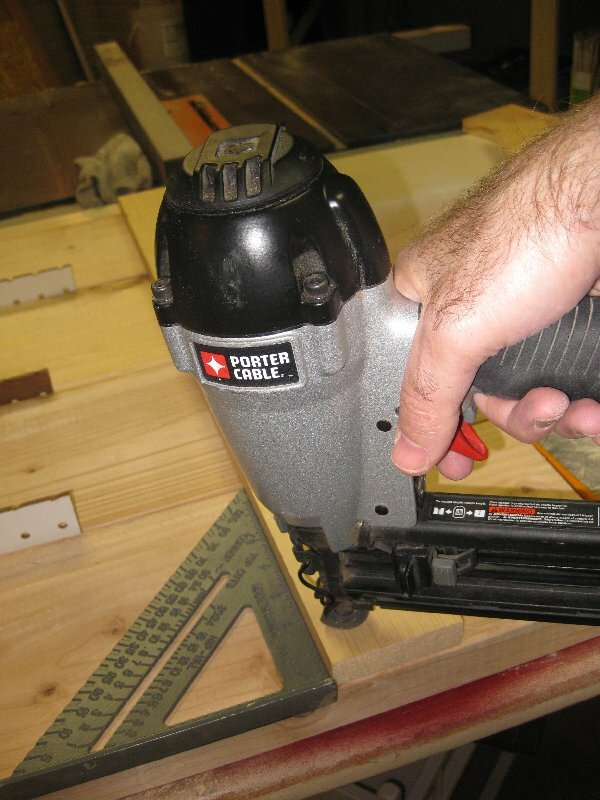 We used a miter saw, but you could also use a circular saw, or even a hand saw. Angle each end to fit against the wooden side braces, cut it, and nail it on. You can add another piece here, going the other direction, to form an “x”, if desired. The key is to measure, measure, then measure again. 5. Paint your door! 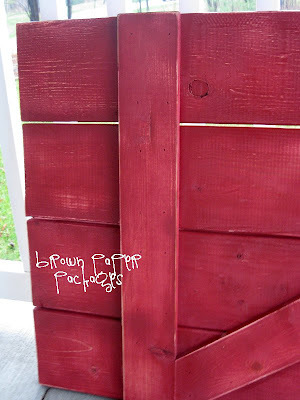 I used spray paint, which I think is easier and faster, but certainly you can use interior paint and brush it on. 6. A power sander is definitely a must for this sanding job, if you want it to be distressed. I used a coarse grit, and went to town! I took off a lot of the paint–hoping to make it look weathered. 7. After you’ve finished sanding, brush off all the dust, and wipe down the entire door. I applied the stain to the cream door to make it even more distressed. 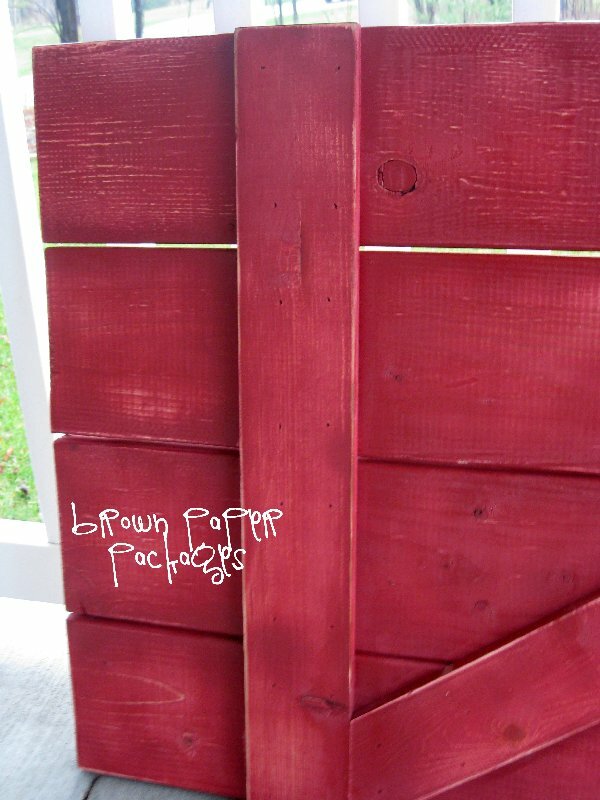 Now you have an adorable barn door! 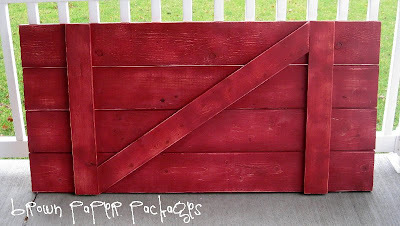 For pictures of these barn doors in my home, click HERE!! So cute! 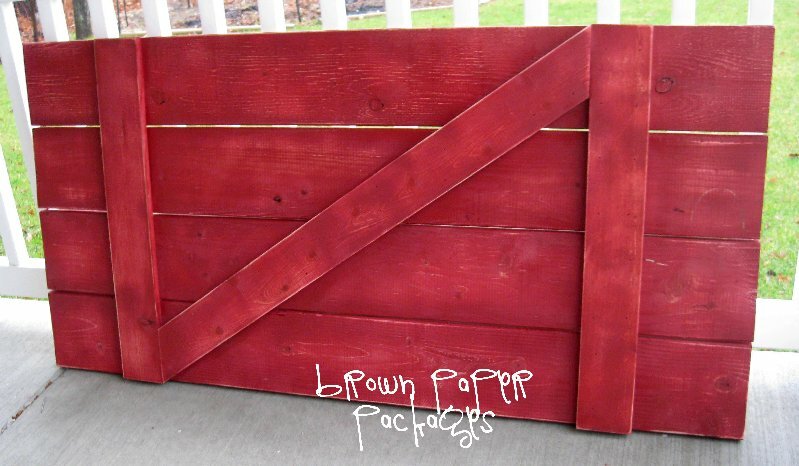 I want to make one for my family room. A fantastic idea, and a great tutorial. Thanks. Thank You for sharing this. I have always wanted a door like this. Now I just have to get hubby to make one. Great tutorial! Your door is adorable! I agree with the above comments. Can you show it to us in action? How did you use it in your laundry room? It's very cute! If there's somehing you want but can't find. make it yourself! Great job. I can't wait to see where you put them. I actually do have access to a couple, but can't figure out what to do with them! Wonderful Kierste! I think I maybe heading over to HD for my help too. But I love this door idea. Thanks, have a wonderful Holiday!! LOVE THIS!! 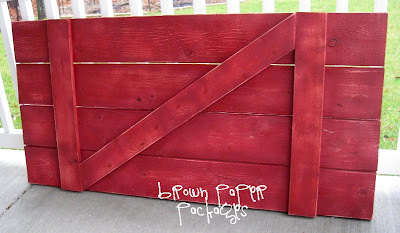 I can never find an old barn door!! Awesome! 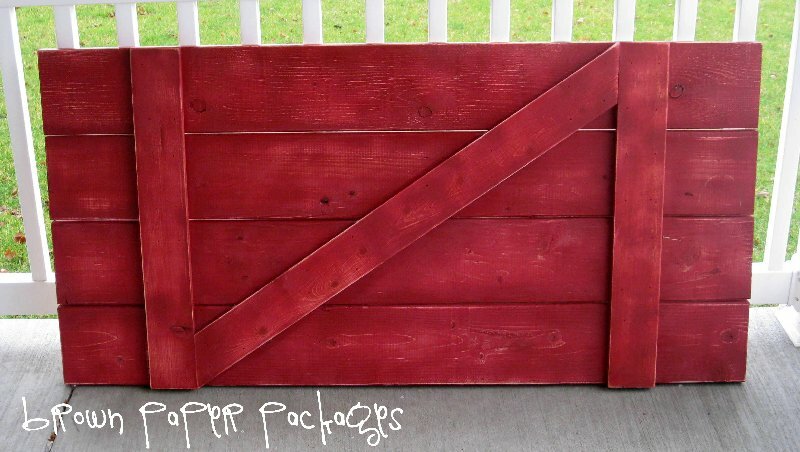 I, too, have always wanted a barn door. Can't wait to see where you put them. Thanks for the tute. Enjoy your company and have a happy Thanksgiving. I look forward to the post showing the doors "in use". Love your blog! Can't wait to take a look around. I like the red door. I had one made for me a couple of years ago. Added an antler handle. Some rusty hinges. And, some fancy hooks. I use is for my coffee mugs, that get used every day. I just finished making this for my living room. The clock I had looked too small but the wreath looks perfect. I love it and can't wait to get compliments on it! It's definitely heavier than I anticipated but it looks so authentic, especially after distressing it with the sander. LOVE LOVE LOVE it!